Participating in this summer’s National Dominican High School Preaching Conference was a glorifying faith experience for everyone who attended. Located at Siena Heights University in Adrian, Michigan, the conference introduced the way of Dominican preaching to Catholic youth through seminars, group discussion, presentations, and hands-on work in the community. As a participant, I learned the deeper meaning of each pillar upon which St. Dominic established the Dominican Order of Preachers — prayer, study, community, and service. Prayer was practiced multiple times daily and explained through sessions led by conference staff who portrayed saints, such as St. Martin de Porres and St. Catherine of Siena, and told their stories. We dove into the many ways St. Dominic taught by learning about “Preaching through the Arts,” which included various forms of song, dance, and artistry. Through our small group discussions, we learned to work as a community on a smaller scale. It was also in the small groups that we had the opportunity to serve, our preaching in action, by travelling to different projects led by groups and programs such as Habitat for Humanity and Permaculture in the university’s surrounding neighborhoods. Although the conference was a new and terrific experience, it was truly the people travelling from places as far as Australia and Puerto Rico, as well as Illinois, Wisconsin, California, and New York, who came together as Dominicans, that made it memorable and faith-deepening. It was bittersweet to say goodbye to new friends who had so positively impacted our lives in only one week. Another special event shared by the St. Mary’s Dominican High School Preaching Team and our mentors was the installation of Sr. Patricia Harvat, O.P. to the General Council of the Adrian Dominican Sisters. Sr. Pat recently left our New Orleans Dominican community where she was the school’s Vice President of Dominican Catholic Identity, to return home to Michigan and serve another Dominican community for a larger purpose. 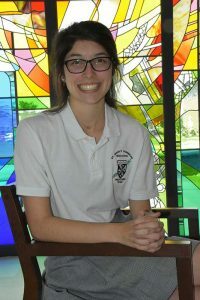 Her positive spirit and influence on our entire student body will truly be missed, and her legacy will be seen through the preaching of those in our St. Mary’s Dominican High School community whose lives she touched.